The new foot stand allows two positions for the device (28° and 46° angle). It can be setup and changed easily without tools. 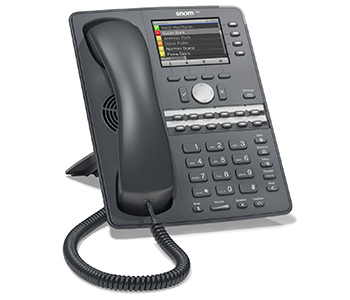 The snom 760 comes in a dark grey color that fits the typical office dress code and makes usage traces less obvious than lighter colors.Like all snom desktop phones, the snom 760 comes with software that has been used in many installations over the last decade. Configuration can be done manually through the built-in web server or through automatic provisioning. There are extensive management and reporting tools available, such as RTCP-XR or PCAP. Customization can be done in various ways, such as the snom mini-browser protocol. The phones come with a preinstalled certificate signed by the snom certifcate authority which makes it possible to securely provision the phone without manual interaction. In addition to the traditional provisioning mechanisms, it comes with TR-069/TR-111 for easy deployment in carrier environments. Download the YipTel Snom 760 HD Datasheet (PDF).